With a great portfolio of tourism products we are able to book any of the Totally Tourism activities for you at Reception and we also offer special packages, combining a stay at Blue Peaks with a once in a lifetime experience such as helicopter flights, Milford Sound excursions or white-water rafting. 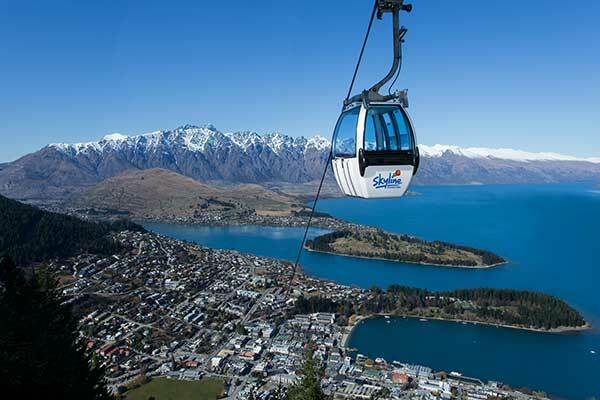 Skyline Queenstown: A must see visitor attraction in Queenstown. The Gondola and Stratosfare Bar & Restaurant offer spectacular views over Queenstown, with function and conference facilities available too. The Luge is an exciting adventure ride for the whole family. The Helicopter Line: Awesome scenic helicopter flights of mountains and lakes in and around Queenstown, Milford Sound & Fiordland National Park with glacier and snow landings. Heli-skiing tours available in winter. Harris Mountains Heli-ski: The ultimate skiing & snowboarding adventure in New Zealand, heli-skiing is an item for your bucket list! The experienced guides take you deep into the Southern Alps to access mountain terrain that provides fresh snow with every run. Queenstown Combos: Save time and money by combining all your Queenstown adventure activities in one. Queenstown Combos offers tour packages with jetboating, helicopter rides, whitewater rafting, bungy jumping, swings, skydiving, gondola and luge rides. Do it all! Mitre Peak Cruises: A must do on your Queenstown holiday is a trip to Milford Sound. Join a coach- cruise- coach day trip from Queenstown or drive yourself to Milford Sound to enjoy a wilderness cruise in the Fiordland National Park. Challenge Rafting: Queenstown adventure activities don’t come much better than this! Whitewater rafting tours are available on the Shotover and Kawarau rivers and are known as some of the best rafting in New Zealand. Heli-rafting tours are also available. Milford Sound Scenic Flights: The most spectacular way to see the alpine lakes, lush rainforest, rugged snow-capped mountains and glaciers. Flights available over Queenstown, Milford Sound and Fiordland & Mount Aspiring National Parks. Mountain Biking: Access world-class mountain bike trails via the Skyline Gondola. Queenstown Bike Park has over 12 tracks with varying terrain for all abilities. Only available in the summer season Sept-May. Bike Tours: Around The Basin Bike Tours offer a personalised service for all your biking needs on the Queenstown Trails…discover more of Queenstown with us. Dunedin Leisure Lodge: The Mercure Leisure Lodge Dunedin is your place to stay in Dunedin. Located close to the Forsyth Barr Stadium and Botanic Gardens it’s just minutes walks from the city but in a quiet street. Glacier Helicopters: – Explore New Zealand’s West Coast from the air, choose from Fox or Franz Glacier and experience the awe-inspiring beauty from above. Skyline Rotorua: Rotorua’s premier attraction for all ages, gondola, exciting Luge adventure rides, romantic dining and functions venue high above Rotorua with extensive views of the lake and geothermal activity.